PART 1 - History of the Moving Coil Receivers, Details on production models 1936 to 1948, Airport Receivers, US Navy models, US Army models, USCG models. This restoration was more mechanical and cosmetic than it was electronic. It involved finding and installing correct vintage parts along with correcting other mechanical problems. Additionally, front panel paint "touch-up" and the mechanical approach to "body work" is covered. Further, the methods for operating a vintage receiver on "original parts" is presented. 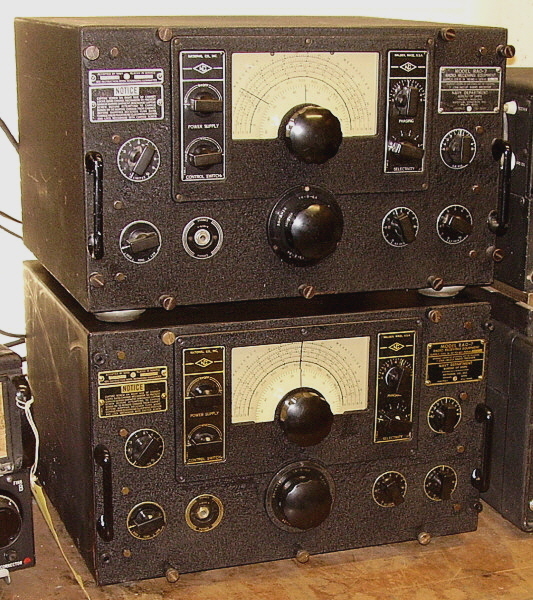 I received an e-mail from fellow Vintage Military Radio Net member WA6OPE asking if I would be interested in a National RCE Airport Receiver. He included some photos that showed the RCE to be complete but in rather "rough" condition. A deal was made and Tom brought the RCE up to the N7RCA Ham Swap Meet in Minden, Nevada (first weekend in June 2014) for delivery and payment. 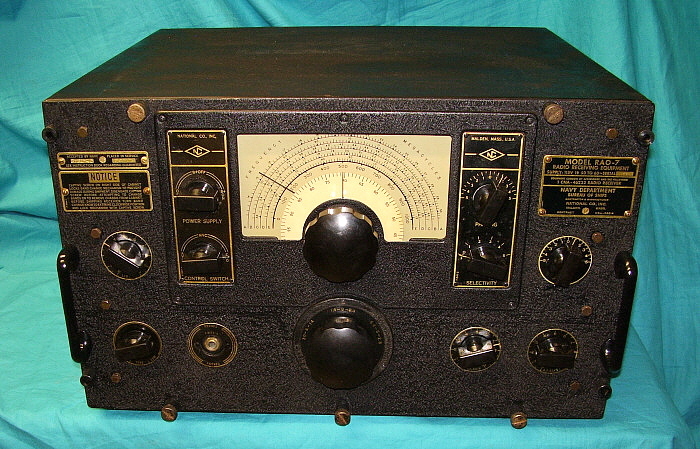 Tom had found the receiver in the SF Bay Area, apparently from a "non-ham" as the RCE had never been worked on or modified since it had been retired from commercial use. Storage in the SF Bay Area, with its salt-air environment, is problematic and long-term storage in a garage or shed can result in significant corrosion. The photo of the chassis below shows the typical surface rust that is found on metal that is stored in unheated buildings. Not terrible but certainly significant. Fortunately, the underneath of the chassis was nearly perfect which implies that condensation was probably responsible for most of the rust. photo right: The RCE exterior as received before any cleaning by me. The exterior had been wiped down. >>> The knobs are correct but it's odd that the RF Gain, Audio Gain and CW Osc knobs are long-boss versions and the Tone is a short-boss type. The knobs appear to have the same patina and probably are original. This implies that National inter-mixed the knob styles on production. This seems normal for National and the fact the the difference is hardly noticeable further convinces me that the knobs are all original. UPDATE - July 21, 2014 - Someone in the past "forced" the PW-D to turn when the tuning condenser or part of the gear box was "frozen." This stripped the main condenser drive gear and the right side reduction gear of several teeth and deformed both gears. The end result was although the PW-D appeared to rotate it only did so for about one turn and then "locked up" due to the deformed gear teeth. Fortunately, I had a few extra gear boxes and I thought that a gear box replacement would fix the problem. However, the original gear box shaft is designed to fit the tuning condenser shaft that is about .375" in diameter. The "after-market" gear boxes were the type National sold for projects and were designed to fit a .250" shaft. Additionally, the original gear box output shaft was "pinned" to the tuning condenser shaft. Needless to say, the two types of gear boxes weren't directly interchangeable. As I thought about this project, it seemed like the way to go was to find a complete NC-100 gearbox and tuning condenser assembly. That would solve the severe rust problem on this tuning condenser and would solve the broken gearbox problem too. About a nine months later (April 2015,) I was able to purchase a complete NC-100 N-PW gearbox with the three gang tuning condenser assembly attached. Also, included was a good condition PW-D. Thanks to George W7HDL. photo left: The RCE interior before any cleaning. Includes lots of spider webs, rust, grease and dust. The first thing to do in the removal of the old tuning capacitor is to desolder the seven TC (tinned copper wire) connections at the solder lugs on the tuning capacitor. The lugs aren't difficult to access if you have a small soldering iron ( I use a 25W Weller.) National didn't wrap the TC wire connections probably because they knew if removal became necessary it would be difficult to "unwrap" the connections. Luckily, the TC wires just slide out when the solder is molten. The LO grid leak is on a tie point that is soldered to the stator lug. Just desolder the entire tie point from the stator lug. Once the seven connections are off, the capacitor can be dismounted by removing the mounting screws. The tuning capacitor has four screws under the chassis that mount the gear box. These need to be removed. You have to move the catacomb from one end to the other to access all of the screws. There is also a bracket at the rear of the tuning capacitor. Remove the chassis screw and leave the bracket mounted to the capacitor (for now.) At this point you should be able to lift the capacitor/gear box assembly off of the chassis. This reveals the tray under the capacitor that has the three insulator blocks with the terminal connections exposed. This area will probably be very dirty and filled with all sorts of solder bits, wire ends, dust and grease - mine was (see photo right.) Clean the tray area using Q-tips to clean the insulator blocks and hard to access areas of the tray. I use WD-40 as a degreaser followed with Glass Plus to remove the WD-40 residue. Be sure the seven lugs on the replacement tuning capacitor are tinned and the holes are fully open. On the terminal blocks, you'll note that there are three short wires and three longer wires plus the wire that has the LO grid leak. The short wires connect to the stators and the long wires connect to the rotors. You have to route the longer wires with a slight bend under the stators and then up to the rotor lugs. Originally, these wires were not sleeved but, if you are worried, you can sleeve them since sleeving was used on some of the later Moving Coil receivers. Guide the TC wires into place as you lower the replacement capacitor into place. You will need a slotted soldering aid tool and long thin needle-nose pliers to guide the TC wire through the holes in the soldering lugs. Once you've soldered the seven wires you can then mount the gear box and the bracket. If your replacement capacitor doesn't have the bracket (mine didn't) use the bracket from the original capacitor. After the capacitor is mounted, disengage the catacomb (place between bands) and check with an ohm meter if you have any shorts from the stators to chassis. Check rotor to stator which should also not have any shorts. Mount the PW-D and check operation of the entire assembly. No problems should be encountered. 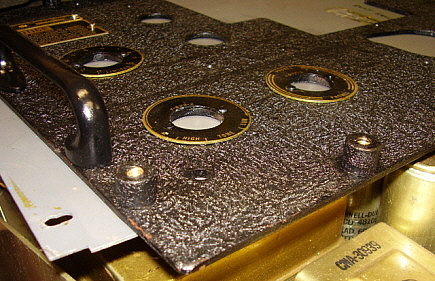 photo above: This is a shot of the tray under the tuning capacitor of the RCE with the tuning cap removed. Note the dirt and grease that collects in this area. If you don't need to remove the tuning cap, this area can be cleaned with Q-tips and small long paint brushes. With the cap out though, the area is easy to clean. Note the TC wire. On each block, the terminal to the left is the stator connection and uses a short length wire. The remaining longer TC wires connect to the rotor lugs. When mounting the replacement cap, you'll have to guide these wires into place as you lower the cap into place. It sounds difficult but it just takes a little patience and good illumination. Be sure to solder the TC connections first and then install the screws to mount the gear box and bracket. Note the corrosion on the chassis. While a perfect condition chassis would be great, sometimes we have to accept that some receivers were located in humid areas and stored in sheds or unsealed garages. This corrosion is not bad enough for a repaint and most will be hidden once all of the parts are reinstalled. Some minor "touch-up" painting will also be required. Front Panel Restoration - The front panel on the RCE was bent and had several nicks to the black wrinkle paint. The panel needed to be straightened out first. I "eyeball" down the edges to see where the bends are. The panel is then placed on a large pine board that is perfectly flat (well, as flat as wood is going to be.) I then use two inch square oak wooden blocks about four inches long and a weighted hammer to gently bend the panel into proper alignment. If carefully done, the result will be a straightened panel with no damage to the paint. More delicate types of paint will require paper or cloth be placed on the pine board for additional protection but old wrinkle finish is tough and quite resistant to scratching or chipping and can be placed directly on the pine board. After the panel is straight I clean it with Glass Plus. I then use nitrocellulose black lacquer that has been thinned down (~ 3 to 1) with lacquer thinner. I use this paint to touch up any significant nicks or scratches. Of course, when the "touching up" is finished, the panel paint looks uneven and spotted. The next step is to use several cotton pads - the round 2" diameter flat pads work best. Wearing nitrile gloves, dab the cotton pad with thinned black lacquer and rub the entire panel to even out the finish. Don't saturate the engraving but don't be too worried if some of the engraving is darkened by the thinned paint. >>> >>> The lacquer will dry in a few minutes and then the engraving has to be "reconditioned." I don't want to scratch the metal so I use a long round wooden skewer (like you use for barbequing) that I've sharpened the end of. I use this tool to go over the engraving to remove any paint, dirt or corrosion that's in the engraving. I use a head-mounted magnifier to enhance my view of the engraved nomenclature as I'm working. The result will be nice looking engraving that doesn't look "scratched out" but just looks clean and somewhat bright. Dust Cover Body Work - The rear panel of the dust cover was really bent up. I used the same body work method of a flat pine board and oak wooden blocks with a weighted hammer to straighten the panel. The rest of the dust cover just needed a little "tweaking" to get all sides and corners square. The back of the dust cover was pretty scratched and the top wasn't much better. Sides were okay. I decided to give the dust cover a light coat of "Satin Black" paint to even out it's overall appearance. Chassis Cleaning - Since there was quite a bit of surface rust I first cleaned the chassis with WD-40. This removes all of the grease and most of the dirt. I tried some different methods on the rust spots but found that the best results were to use WD-40 and lightly rub with 0000 steel wool. This reduces the rust spots to a minimum and doesn't hurt the chassis paint. Don't be too aggressive though. Lightly use the steel wool. Avoid the ink-stamped tube identifications as the steel wool will remove these. Next, wash the chassis with Glass Plus and a paper towel. You can somewhat "polish" the paint with the paper towels. This gets the chassis paint looking about as good as it can. The aluminum cans were slightly pitted under the dirt. I lightly removed the dirt with WD-40 applied with a cotton cloth. Use a circular motion to avoid streaking of the cleaning action. Don't rub too hard or you'll polish the aluminum which then doesn't look original. Lightly clean the WD-40 with Glass Plus. The end result should look flat matte finish that is clean. The audio output transformer was the worst condition and really didn't respond to much cleaning but the IF cans turned out quite nice. Bar Knob Skirts - The procedure to clean these solid German Silver skirts is in the section "Detailing the NC-101X" further down this page. Essentially, NaOH (Easy-Off Oven Cleaner) is used to remove corrosion and grunge. Then the knob is washed in water to remove the NaOH and cleaned with Glass Plus. Then the skirt is polished with Wenol's. The skirts are the same material all the way through so this method works great. photo left: The RCE chassis after cleaning and installation of the replacement tuning condenser and gear box. Although the chassis paint isn't perfect, it's not too bad. The aluminum cans turned out matte finish after cleaning. PW-D Repaint - The original PW-D was "lumpy" with corrosion under the paint. This is difficult to remove since the base metal is damaged. I decided to just use another PW-D that was in better condition but still needed a repaint. The Airport receivers used a light-gray paint on the Index dial and then black with white numbers on the Number dial. I had an excellent condition gray PW-D that was on my RCF-2 receiver. This was used to "match" some automotive lacquer paint from All Auto Paints in Carson City. They will do the match and then fill a spray can with the paint for $18. The old paint has to be removed from the Index dial. This can be accomplished with Jasco Epoxy Stripper (methylene chloride - so do it outside using Platex outer gloves and nitrile inner gloves.) Clean with steel wool and alcohol and then clean the Index dial with lacquer thinner afterwards. This prep is enough to then apply the lacquer without any primer (that's the way the originals were painted.) Don't spray more than two coats since modern auto paint has some fillers in it which might "fill" the index lines too much. Two coats should be enough. Let the paint set overnight. Then use a mixture Artist's Acrylic paint of white and raw sienna to create a manila color (beige color) to fill the index lines. Don't use pure white - it will look way too bright. Apply the manila paint a few index lines at a time (five to ten works well.) Let the paint set for one minute and then wipe off with a damp paper towel piece (dampened with Glass Plus works best.) You might have to do two applications of paint to get a really good looking fill. Let the index lines dry for a day. Wipe the Index dial with a cotton cloth. Reassemble the PW-D if the Number dial is is good shape. Initial Testing - Since the commercial and military versions of the NC-100 receivers use oil-filled paper dielectric filter capacitors, frequently they can be operated with all original parts. I really wasn't planning on using the RCE as a station receiver and the set would only be powered up for testing and maybe a casual listen around the bands. When long-term use is planned (like the NC-100ASD or the NC-200 profiled above) it is necessary that all paper-wax capacitors be replaced since their leakage current is only going to get worse as the receiver is operated. But, I felt that the RCE could be safely operated with all of the original components if the filter capacitors tested okay. I just checked these parts for shorts and for value and found them to be okay. Before power-up, it's a good idea to just check the DCR of the B+ to chassis. It should be very high resistance which would indicate that there are no "power-off" shorts to chassis. Upon power-up, I watch the rectifier tube carefully. If there is a short or other type of excessive load on the B+, the rectifier tube will glow bluish-purple inside the filament to plate area. If the rectifier appears normal, then B+ should come up to voltage in about 20 seconds or so. I measure it to be sure it's in spec and not loaded down. I watch for any indications of sudden heating which would indicate a heavy current flow through a resistor due to a shorted or nearly shorted bypass capacitor. Luckily, none of these things happened and the RCE powered up fine and did work somewhat. Of course, since I had replaced the tuning capacitor, it was pretty much out-of-alignment but still a few AM BC stations could be tuned in which let me know the receiver basically was operational. I performed an IF alignment and found that was pretty close. The RF tracking was way out, as expected. I kept having trouble with the contacts of the catacomb with the receiver on its side (necessary for RF tracking alignment.) The catacomb had to come out for further checking of the pins and receiving contacts. Mechanically, the catacomb seemed to be "flexing" the chassis when bands were changed which also warranted a thorough inspection. Catacomb Movement Issues - The catacomb problem was due to some corrosion spots here and there on the shaft. These were removed with 600 grit Alu-Oxide paper and oil. The bearings in the catacomb were also oiled. The flexing of the chassis was due to the shaft mounting screws not being fully tightened. The front bearing for the pinion gear needed another spacer to be added to have the rack and pinion gears fully mesh and to have the shaft bearing fully within the catacomb slot. A light coating of grease was applied to both the shaft and to the rack. On the pins and split-contacts, they were of course dry which increased the force necessary to have all fifteen pins to engage the contacts. Originally clean grease was applied to the pins although nowadays this has dried up or has turned into a "dirt-trap." I cleaned all of the pins and split-contacts with DeOxit and Q-tips, reapplied new clean grease (very light coating) and then reassembled. The bandswitching was now a fairly light action and there was no more flexing of the chassis. Back to Aligning the RF Tracking - The LO kept dropping out at the low end of the bands on bands A, B and C. Bands D and H seemed okay. The entire operation was somewhat erratic. I checked the connections to the tuning condenser. I found that during soldering of the TC connections I had not soldered the lower TC wire to the LO stator. The wire was thru the hole in the lug but just not soldered. This was enough for the LO to not operate correctly on the higher frequencies. Soldering the TC wire corrected the problem and the alignment was completed on all bands. Performance - I'm quite surprised that this RCE actually works better than my much nicer condition RCF-2. I guess that goes to show that appearances can be deceiving. Anyway, the RCE now looks pretty good but how does it perform? I used a 7000Z ohm to 8Z ohm transformer on a 10" speaker that is mounted in the larger style National speaker housing for the RCE. When I tested the RCF-2, I had used a military LS-3 speaker that had a 600Z ohm transformer installed. However, the DCR of the output transformer on the RCE measures 280 ohms which seems too high for a 600Z ohm output which would normally be around 50 to 100 ohms DCR. The 7K set-up seemed to provide a normal reproduction level. AVC has a rather slow attack, probably a capacitor problem. Sensitivity is respectable with 40M ham signals coming in strong. I tried 20M and also heard a few hams there. The surprise was 11M CB with many strong AM signals in that region of the spectrum. No ham 10M sigs were heard. The AM BC signals (above 1300kc) were strong but the audio not very good. The DGPS nodes around 300kc were quite strong on band H. I didn't hear any NDBs because I was testing performance during the daytime. I'm sure that if I went ahead an did a full "re-cap" and replaced any "drifting" resistors followed by another complete alignment, the RCE would be a really great performer,... when compared to other similar pre-WWII receivers. Many times the receivers we find don't really require a total restoration or rebuild. Sometimes only a little cleaning and repair of a few minor problems will result in a usable receiver that is performing quite well. I call this "detailing" a receiver. Mainly a cosmetic job with only a little electronic work necessary. Here's how we did this type of task on a NC-101X receiver recently. Initial Inspection - I bought this NC-101X from an ad on QTH.com with only the photos and description to go by. Dave N7RK was very accurate in both departments and his packing job was first rate. The NC-101X arrived with no damage. It is shown in "as acquired" condition in the photo to the left. An inspection found that the receiver was as described,...very nice external condition with just a few blemishes and dirty but mostly complete on the inside. The dirt was a dusty type with some grease and maybe some tobacco deposits mixed in. This "dirt" made a very good preservative for the gray paint used on the chassis. Dave had said the receiver worked so I wasn't shy about just "going for it" and applying power. Although the NC-101X did function it had some hum problems. Removing the bottom cover revealed that the dual electrolytic was disconnected. I figured this was probably for a reason and decided to replace the filter caps before going any further. I mounted the three 10uf filter caps under the chassis. Since all of the original paper caps had been replaced several decades ago with Sprague molded capacitors (not Black Beauties but the later versions with a black plastic body with red nomenclature) I felt these were probably okay. Upon power up the NC-101X now seemed to work fairly well. I hadn't tested any of the tubes and really hadn't done much of anything other than confirm that the receiver did function and all of the major parts of the set worked fine. All that was now necessary was detailing the cosmetics and a complete servicing of the electronics. Chassis Inspection: The chassis "as received" is shown in the photo to the right. The dirt is obvious and as mentioned above actually acted as a preservative for the paint. The first thing noticed is that only one can-type electrolytic capacitor is present. Although it is very similar to the originals, it actually isn't an original type. The original filters were all 10uf 450wvdc individual capacitors. The one installed is a dual capacitor which is not correct. The next thing noticeable is that the power transformer appears rather tall. A quick look under the chassis showed that the power transformer was indeed marked "NC-100" but the complete ink stamp was "NC-100-25" which indicated that this transformer was for 25 cycle AC. All power transformers for 25 cycle operation will have extra laminations installed to increase the iron and prevent over-heating on such a low frequency AC. Operating a 25 cycle transformer on 60 cycles will cause no problems and many so-called 25 cycle transformers are actually rated "25 to 60 cycles." The tuning condenser appeared to be slightly rusty however this wasn't the case. What appeared to be rust was actually greasy dirt probably mixed with tobacco smoke that turned the metal pieces a rusty color. The rotor hubs are brass but it's difficult to tell through the dirt. The tuning seemed to work fine so that indicated that the gear box probably only needed to be cleaned and lubricated. I was lucky that nobody had tried to clean the aluminum IF transformer cans and BFO can. Improper cleaning of this soft aluminum will end up polishing the matte finish. Under the Chassis - This area had been recapped several years ago using Sprague black plastic molded capacitors (with red nomenclature - not Black Beauties.) The installation appeared to be a professional job with all of the capacitors matching in manufacturer and type used. Soldering appeared professional. Many hams WERE professionals in the electronics business besides being hams. All of the resistors were Centralab types that National had changed over to by 1937. These Centralab resistors are excellent in quality with carbon drifting almost never being encountered. Cosmetic Inspection - The NC-101X only had some minor blemishes to the original black wrinkle finish. The skirted knobs were very dirty with tobacco deposits and some tarnish. The PW-D dial, while in pretty nice original condition, did show some wear especially at the point where the Index dial angles off. Here the paint was worn through to the metal. There were no gouges or scratches as is normally found on poor condition PW-D dials. There were no extra holes drilled anywhere on the chassis or the cabinet. Getting the NC-101X Operational - This isn't restoring, it's just getting the receiver to a point where I could use it and do some evaluation of its performance. The new filters got the NC-101X running with no hum. The receiver came with 6V6 tubes installed in the audio output. Original tubes were 6F6 and while you can substitute the 6V6 and it will draw only 2 amps of heater current versus the 3 amps required for the 6F6, there are internal structural differences between the two tube types. The 6V6 is a beam-power pentode while the 6F6 is a regular pentode. To some ears, the 6V6 will sound a bit harsh compared to the 6F6 if the circuit and transformers were designed for 6F6 tubes. This was the case with the NC-101X, the 6F6 tubes sound a little bit mellower and slightly more bassy - at least with the original 10" Rola electrodynamic speaker. At this point the NC-101X was performing well enough to try using it as a station receiver. I used it on both 80M and on 40M on the AM nets available on those bands. The NC-101X was surprisingly effective as a station receiver. Sensitivity was ample although successful 80M or 40M reception doesn't require too much of a receiver anyway. The important thing was how the receiver sounded and how immune to adjacent SSB activity it would be. Performance was good enough that I decided to proceed and do the complete "detailing" followed by a complete IF/RF alignment. Disassembly - Without removing the cabinet it's next to impossible to access all of the areas of the chassis for complete cleaning. The cabinet is easy to remove. First, remove all of the tubes. Then take off all of the knobs. Then note that the RF Gain control is mounted to the front panel as is the Tone Control. Remove the mounting nuts on these two controls. Remove the mounting nut for the phone jack assembly. Dismount the pilot lamp assembly. Remove the back cover and lid assembly by removing eight mounting screws. Now remove the four large screws, nuts and lock washers that mount the cabinet and front panel assembly to the chassis. The cabinet and front panel assembly should now slide forward to clear the control shafts and then can be lifted off. Cabinet removal exposes all of the chassis and chassis mounted components for thorough cleaning. Cleaning the Chassis - As mentioned, the dirt and grunge was a dust combined with grease and tobacco deposits. Since grease was involved I used WD-40 as a cleaner. WD-40 generally will not react with older types of paint, which in this case was lacquer. The dirt and grunge came off very easily and left the chassis paint clean and having somewhat of a shine. The application of the WD-40 was with a medium size paint brush and sometimes Q-tips when the area was too small for the brush. Paper towel strips were used for WD-40 removal. This was followed by another cleaning using Glass Plus to remove the WD-40 residue. Glass Plus doesn't contain ammonia and won't react with painted surfaces (don't use Windex.) The ceramic tube sockets were cleaned with De-Oxit and a clean tooth brush and wiped down with a paper towel strip. As expected, the grunge had acted as a paint preservative and the chassis turned out to be in excellent condition. Cleaning the Tuning Condenser - Again, WD-40 was used as a cleaning agent due to the greasy nature of the grunge. Small paint brushes and Q-tips were used for the most part. The nickel plated spacers were cleaned with a brass tooth brush (brass won't scratch the Nickel plating) and WD-40 which removed the discoloration completely. The ceramic spacers had to be cleaned with Q-tips. After all of the grunge was removed, the tuning condenser was further cleaned using Glass Plus to remove the WD-40 residue. Paper towel strips or Q-tips were used to remove excess Glass Plus. After the tuning condenser had time to dry (overnight) it was lubricated with DeOxit on the rotor contacts and 10W oil on the bearings. Cleaning Under the Tuning Condenser - This area seems to really attract dirt. I didn't want to remove the tuning condenser so I used long handled small paint brushes and bent Q-tips to clean this area with WD-40 followed by Glass Plus. You have to fit the brushes and Q-tips under and sometimes through the tuning condenser. Photo Right: This shows the chassis after half of it has been cleaned with WD-40 and Glass Plus. The tuning condenser has also been cleaned in this shot. Note that the three electrolytics were removed for cleaning. Actually, two were missing and the third wasn't original and wasn't connected up anyway. With the electrolytics out of the way, cleaning is easy around the tuning condenser and reinstallation of these capacitors is not difficult. I didn't do any polishing of the chassis paint. This is how certain kinds of dirt and grunge end up protecting the original paint finish. The WD-40 cuts through the grease and removes it and the associated dirt. Then the Glass Plus is used to remove the WD-40 residue. The PW-D - The original PW-D had a badly worn Number Dial that "chattered" if the dial was turned too fast. Even lubricating the elliptic hub didn't stop the "chattering." I swapped another Number Dial to correct the problem temporarily. The Index Dial was in pretty good shape with no scratches but the paint was worn through around the tuning knob. Eventually, I wanted to find a good condition replacement. It ended up I didn't have to wait all that long. A couple of weeks after acquiring the NC-101X, I was at the annual Minden, Nevada swap meet put on by N7RCA. What should turn up but an excellent condition PW-D in a protective plastic bag - nice. The paint was very close to the original NC-101X's PW-D in that it was the dark bronze-black shading even though the new PW-D was actually a WWII vintage piece. All the new PW-D needed was to be disassembled, cleaned, lubricated and reassembled to end up functioning perfectly - and looking incredibly nice. Cleaning the Skirted Knobs - The knobs on this NC-101X were the early style knobs with the short boss on the bakelite bar knob section. These knobs were advertised by National as having skirts that were "solid German Silver." German Silver is an alloy of Nickel, Copper and Zinc that generally is used in plating but also can be used as a solid metal alloy. In this case, the metal is the same all the way through so it can be polished heavily without wearing through any plating. The skirts on these knobs were pretty tarnished and I initially cleaned off the oxidation, tobacco deposits and grunge by carefully using NaOH (Sodium Hydroxide) commonly found in Easy Off Oven Cleaner. Using a small paint brush, I carefully painted some EOOC (that I had sprayed into a paper cup) on the skirt. Be sure to avoid getting EOOC on the bakelite bar knob. Work the EOOC around on the skirt and then rinse under cold water. This will remove all crud and oxidation. Follow this by polishing the skirt and the bar knob with Wenol's Polish (similar to Semichrome.) Since the skirt on these early knobs is solid German Silver, the polishing works great and if the EOOC has removed any of the nomenclature fill, the polishing residue is "jet black" and ends up filling the nomenclature perfectly. The Can Electrolytic Capacitors - This wasn't going to be one of my "museum quality" restorations where I restuffed caps and made the chassis look totally original both on top and underneath. Since it had been professionally recapped in the past with excellent components and workmanship, I decided to leave the underneath "as-is." I had already connected three new 10uf 450wvdc electrolytic capacitors under the chassis so the receiver was functional. I did want the top of the chassis to look correct however. So, I dug through the "junk boxes" until I found three close matching can electrolytics. These had to not only match each other but had to be similar to what was originally in the NC-101X. Luckily, I was able to come up with three good candidates. Since these were dummy-cans, I removed the wires from the bottom of the can. I also repainted to top silver (although some NC-100s are found with red or brown tops.) When mounted, everything looked convincing correct. Now, anytime in the future, if I want to do a "museum quality" restoration, these cans can be rebuilt into functional components. Photo Right: This shows the NC-101X chassis top after detailing. This is after the painted surfaces have been given the final cleaning with Glass Plus and polished with a soft paper towel. Note that tuning condenser hubs now look like they should - brass. Also, the nickel plated spacers look like nickel. Don't get too aggressive when cleaning the tops of the IF transformers, the top of the BFO can or the interstage transformer can. These aluminum cans are pretty soft and will "polish" quickly if cleaned or rubbed aggressively. Use WD-40 first with a soft brush to gently remove any grunge then follow with Glass Plus. Dab with a soft cloth to dry - don't rub. This should leave the cans appearing as a matte aluminum finish - as original. Cabinet Detailing - The cabinet pieces were in very good condition and only required a little touch up painting. I use Artist's Acrylic Mars Black for most touch ups but sometimes I also will use nitrocellulose jet black lacquer thinned and applied with a small brush. It depends on the blemish. In this case, the inner surface of the cabinet where it contacted the chassis had some surface rust. Cleaning this up removed the original black paint (which was lacquer.) This was touched up with the lacquer. The wrinkle finish blemishes were touched up with the acrylic paint applied with a small brush or Q-tip. Front Panel Detailing - The front panel was in very good condition and only required cleaning and touch up. I used Glass Plus applied with a 2" paint brush and then the Glass Plus was worked into the panel using the paint brush. After a couple of minutes cleaning the dirty residue was wiped off with a paper towel. Then a second spray down with Glass Plus and wipe down with a clean paper towel. This gentle cleaning will usually get most of the grunge off. I then touched up the panel and let the acrylic dry overnight. The next day I used Armor-All to polish the panel and also gave the cabinet the same treatment. If I was doing this today (2016) I'd use 10W machine oil instead of Armor-All. I find the results less harsh-looking. Reassembly and Test - About the only thing to mention on reassembly is to be sure to set the PW-D correctly as described in the section "PW-D Micrometer Dial Servicing." Basically, you have to set the tuning condenser to "half mesh" and then install the PW-D which will be set to "250." When installed correctly you should be able to cover 0 to 500 with an overlap on each end that is around 10 divisions. Alignment - The IF is aligned first and you have to determine the frequency of the crystal that's installed in the crystal filter. Using this exact frequency in your IF alignment will assure that the crystal filter is a useful tool for combating QRM. Switch on the crystal filter and adjust the Selectivity and Phasing controls for a narrow bandwidth. With the RF signal generator connected to the grid of the mixer tube, sweep the generator frequency through 456kc and listen for a peaking noise as you pass the crystal's frequency. With a digital frequency counter connected to the RF signal generator note the exact frequency that the crystal responds to. This will be the IF used for alignment. In my case, the crystal was 456kc. Adjust the IF capacitors for a peak indication using the "eye-tube." You can also connect a VTVM up to the AVC line and monitor that voltage for alignment purposes. Be sure to use a 400 hz modulated signal on your RF generator and have the receiver in AVC. >>> Now check the tracking by tuning down to the low end (PW-D at 50 and the correct input frequency from the signal generator) and you'll probably find it is very close. Return to 450 and the correct input frequency and set the Mixer and the RF stages for peak. You can measure the AVC voltage or you can use the "eye-tube" for a peak indicator. I just used the "eye-tube." Perform this same procedure on each band. Be careful on the 10M band as it is very easy to align to an image. With only one RF amplifier stage the image ratio isn't all that great on 10M so keep the RF generator amplitude as low as possible and check your LO tracking carefully. If you align to an image the tracking will not be accurate. You can also align the Mixer stage to an image and this would show up as uneven gain across the 10M band. Usually if you keep the RF input as low as possible and adjust for the strongest peak that will be the correct setting. Performance - I'm impressed by the NC-101X. It's certainly sensitive enough on 80M and 40M. I've listened on 20M and it seems to do very well on that band too. I haven't tried 10M but I think it would also be adequate there. Certainly, if 10M performance was an issue, an external RF Preselector could be added. IF bandwidth is probably about 8kc without the Crystal Filter. QRM hasn't been a problem but I'm sure the Crystal Filter would be able to eliminate all but on-frequency interference. The audio is really nice. I'm using the matching 10" Rola electrodynamic speaker that came installed in the larger National speaker box. This seems to reproduce AM signals quite well and there is quite a bit of bass in some signals. The Tone control is not very responsive and does most of its action in the last 10% of rotation. On the station antenna, which is a 135 foot center-fed tuned inverted vee, the signals on 80M are so strong that I have to reduce the RF gain to about 7, even with the AVC on. This is to get the "eye-tube" to show some reaction since with the RF gain at full the eye-tube will always remain closed. Since my use of the NC-101X has been on 80M and 40M AM, I haven't noticed all that much drift. The bandspread action of the NC-101X will make drift show up more since a slight drift of a few kc would be indicated with as many as 8 or 10 divisions on the PW-D. The most drift I've noticed is about three divisions over an entire net time (about an hour.) Remember though, this is in the AM mode. Of course if you're monitoring a SSB net or doing CW, the drift in the BFO will also be a factor and more drift will probably be noticeable. Overall, I'm impressed enough with the NC-101X that I've set it up with the Collins 32V-2 transmitter and have been using it as the station receiver (off and on) for several weeks now. Using the Eye-Tube - I've been using the NC-101X as a station receiver for a while now. I've found that for AM on either 80M or 40M, I can't really run the RF gain "wide open" (receiving on the station antenna) and have the eye-tube show anything other than fully closed. Backing the RF gain down is necessary and provides some interesting possibilities. I've been listening to the AM "round-table" stations and adjusting the RF gain to have the eye-tube fully closed on the strongest station. This usually has the RF gain set at about 7 or 8. Now all of the other stations are normally going to show something less than fully closed on the eye-tube when they transmit. After a couple of sessions you get to where you can sort of estimate signal strength relative to the strongest station. It might have been something that the original owners of early NC-101X receivers did - at least if they operated AM. This isn't a restoration write-up. It's detailing a receiver that had already been recapped but was not completed as far as mechanics and assembly. 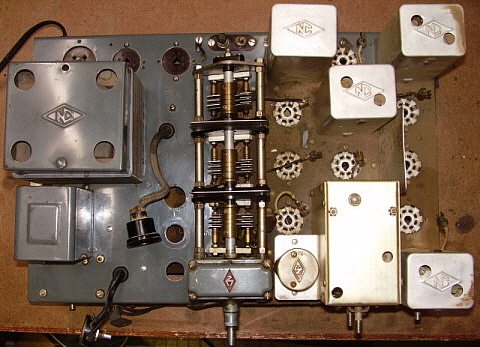 Also, this write-up provides a way to present more detailed information on this "seldom-encountered" receiver, including photos of the chain drive assembly for moving the catacomb. I had been seeing this NC-80X being offered for sale for awhile. I was interested but, as usual, I was distracted away from an actual purchase many times. Eventually, I had to contact N7RK and work out how to purchase this NC-80X. As always, Dave provided excellent photos and I knew in advance what I was getting into as a project. Packing and shipping from Arizona was first class all the way. 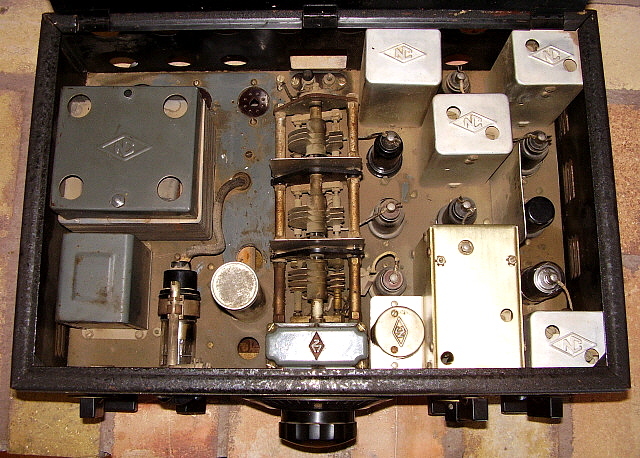 As described, the receiver was already recapped but had bad filter caps and some of the dial bezel and dial lamp assembly was still apart. The first step though was complete disassembly for a thorough clean up. Disassembly - The cabinet is held together with sheet metal screws. The front and sides are one sheet metal piece. The back is one sheet metal piece. The top and bottom are sheet metal pieces. The only unusual feature is the eleven screws and shoulder-nuts that isolate the chassis from the cabinet. Serial Number - I looked and looked for the serial number on this NC-80X. Most National receivers have the serial number stamped into the chassis but not the NC-80X. Complete cleaning and some disassembly proved to me that there wasn't a serial number anywhere on the chassis. Sometime into the project, I was thinking, "I wonder if National stamped the cabinet instead." Looking at the back panel in the proper light and there it was,...stamped just below the opening for the headphone jack,...C 475. Difficult to see since the black wrinkle paint was applied after the stamping of the serial number. The Bezel and the Station Markers - The bezel was brown plastic and there were six curved metal clips that were inserted into a lengthwise slot at the bottom of the bezel. What did these clips do? At first I thought it was some sort of mechanical method to mount the bezel - it wasn't. Looking at the advertising artwork, I could see that the points of the clips were next to dial scale. By reverse-mounting the clips, they then revealed their purpose - they were station indicators. The clips have a portion that protrudes out the bottom slot and one can then grab this "tab" and slide the clip in its slot until the "pointer" is aligned with where your favorite station was located on the dial. The bezel was missing its clear plastic dial cover. I assume it was plastic because whatever was original was held in place with drive pins. I think glass would have broken when the drive pins were installed but plastic would work fine. I used .030" thick clear plastic cut to fit and mounted with Duco cement. Only one drive pin was present so the Duco cement was an option that worked fine. Catacomb Chain Drive System - The small coil catacomb of the NC-80X only requires a chain drive to move it into position for the four bands. The catacomb seemed to be locked in place so it was disassembled. There wasn't anything wrong but, as with the NC-80X's big brother the NC-100, the pins and the receiving contacts must be clean and the rod bearing must be lubricated for smooth, easy operation of the band switching system. There are only 10 pins to engage (rather than the 15 pins on the NC-100) so the chain drive is adequate for moving the catacomb into position. Thorough cleaning got everything working smoothly. Coil Assemblies - These are identified as W, X, Y and Z for frequency coverage and 1 for Mixer function and 2 for Local Oscillator function. They mount in the same manner as the NC-100 coil assemblies. Since the IF is 1560kc, these coils are different than the NC-100 series coils. Chassis Cleaning - The chassis was cleaned as described in the NC-101X write-up above. I use WD-40 to cut the grease and Glass Plus to clean up the residue. This chassis had mostly soot deposits - weird. Anyway, they cleaned up with just the Glass Plus. Complete disassembly allows for a thorough cleaning job. 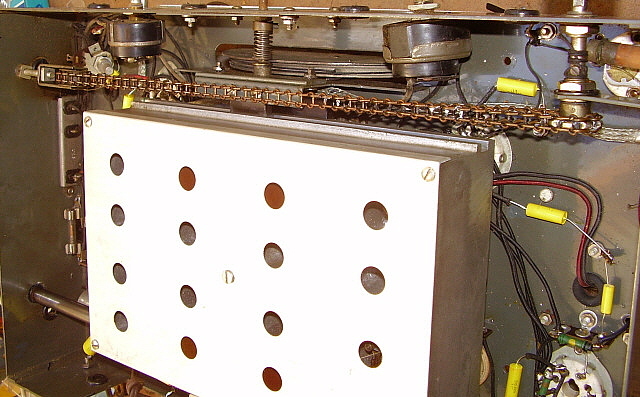 photo right: The smaller-than-usual coil catacomb showing the chain drive system. Cabinet - Four pieces comprise the cabinet. The rear panel, the front/sides piece, the top and the bottom. All pieces were cleaned and then touched-up with black nitrocellulose lacquer. Afterward the pieces were rubbed down with 10W machine oil (this does work great - better than ArmorAll.) The two nomenclature panels are held in place with the control mounting hardware so their removal and reinstallation is very easy. The "ground wire" lug for the wire for the antenna input coil return is riveted to the cabinet. This was missing and a new lug, wire and spade lug needed to be installed. Bezel Mounting - The bezel can only be mounted or dismounted after the cabinet has been taken off of the chassis. This allows access to the back side of the front panel. Four 6-32 screws hold the bezel in place. They screw in from the inside of the bezel behind the clear dial cover. A gasket is needed so the bezel will mount "tight" against the cabinet. I used a thin piece of friction tape to make a gasket that accomplished the proper spacing. Loud Speaker - The NC-80X doesn't have an internal audio output transformer. The pin jacks connect to B+ and to the 25L6 plate. 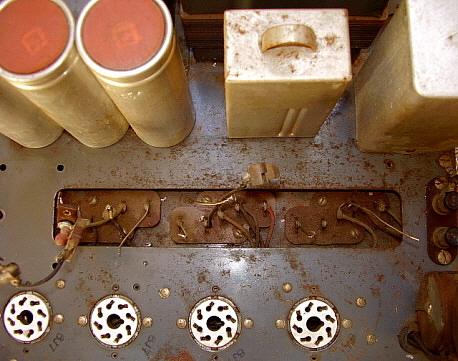 The speaker that was intended for use with the NC-80X was the standard National 8" table speaker that used a PM speaker with an audio output transformer mounted on the speaker. This is the same speaker used with the HRO Senior. Primary impedance is about 7000Z and the secondary is 8.0Z. Filter Capacitors - Originally the NC-80X used two 40uf 150wvdc electrolytic capacitors that mounted to the chassis via large threaded bases. The negative of each capacitor is connected to chassis (B-.) I left the original caps in place and removed their connecting wires. I mounted two Sprague 50uf 150wvdc axial mount electrolytics (yes, they were old ones from 1983.) I tested and reformed the caps before installing. AC-DC and Chassis Isolation - Everyone knows that in a receiver with no power transformer, the circuit is directly connected to the line. B- is usually chassis but in some cases, with improper power plug orientation, the chassis can have AC voltage present. If this were also on the metal cabinet, then the operator would likely receive a line voltage shock if he was touching the cabinet and another part of his body was at ground. Realizing this possibility, all designers of AC-DC radios isolate the chassis from the metal cabinet. National did this using eleven rubber grommets and special shouldered nuts and screws to provide complete isolation of the chassis. Additionally, realizing that someone could lift the lid on the receiver and touch the chassis parts while the receiver was powered up, National didn't provide a lift-lid. Instead the lid is screw-mounted. All of the rubber grommets were natural rubber and had disintegrated or were in that process. All grommets had to be replaced. Modern black rubber grommets were used since the brown natural rubber ones are difficult to find these days. Pre-power-up - I tested all of the tubes and found that the 6B8 was weak but all other tubes tested fine. I installed a vintage power plug on the AC line cord and was ready to test the NC-80X. But wait a minute,...I didn't want to just plug this into the AC line direct. So, I had to drag out the hefty isolation transformer that I have (good for 20 amps) and actually have something between the house AC line and the NC-80X. Anyway, I was going to need the isolation transformer for the alignment since if you try to hook up test gear to an AC-DC radio there will usually be a conflict between grounds and how the radio is connected to the AC line. Best to use an isolation transformer to eliminate any problems. Power-up - With power applied the NC-80X lamps didn't come on. This was just a loose lamp. The receiver came to life tuned to the broadcast band. Very good audio from the 8" National speaker. Just a 25 foot wire for an antenna. Bands W and X functioned fine and calibration was fairly close. I tuned into some 75 meter AM signals which sounded quite nice. Bands Y and Z only tuned in signals on a portion of their coverage which indicated a LO problem. Minor Problem - There was no B+ going to the plate of the LO tube. Originally there had been a jumper between pins 3 and 4 which allowed the plate to connect to the screen for the B+ connection. For some reason the jumper was missing and installing a new jumper got the LO working on all bands correctly. Alignment - Since the NC-80X doesn't have a TRF stage it might be possible to align the LO or the Mixer to an image, especially on the two highest frequency bands. However, this would require an extremely high level input from the signal generator. Since the IF is at 1560kc, an image would appear 3120kc lower than its actual frequency. Images are caused when an "untuned" signal gets pass a non-selective RF or Antenna stage and mixes with the LO to produce the signal at the IF. Normally the LO would be operating above the tuned signal but mixing can also take place with the LO below the received signal and that's what happens with an image. It's usually the non-tuned signal mixing with the LO below its frequency. That's why images are normally two times the IF below the actual frequency of the signal that is "leaking thru." Since the NC-80X's images are 3120kc down, the normal selectivity of the antenna coils are sufficient to practically eliminate image response. IF alignment is straight forward except that the frequency is 1560kc. Be sure to use the actual crystal frequency for IF alignment and then your crystal filter will function correctly. You can use either an audio output level meter or use a VTVM monitoring the AVC line as a "peak" indicator. Performance - Surprising! I was not expecting the NC-80X to be a very good performer but it has plenty of sensitivity and pulls in signals even up to 10 meters. The selectivity is via the crystal filter and it works like the HRO crystal filter in that there is a "peak" adjustment on the selectivity control that should be set, even when the crystal filter is off. I used an eight inch HRO speaker box and the audio on AM BC is very good. SW BC also sounds good on strong signals. Dial accuracy is fair and the resolution is very limited. The BFO provides a fairly stable oscillation and allows decent CW or even SSB however drift would be an issue if you wanted to monitor a SSB net over a long period of time. Drift is certainly normal for the vintage of the NC-80X and not objectionable. The down side of the NC-80X is mechanical. The chain driven band change feels like the chassis flexes whenever it is operated. The band in use indicator is very crude and although it does its function it's basically a string and a wire spring operated device. The clips for indicating favorite stations are crude and always seems to be leaning one way or the other. It's obvious that National put most of the cost cutting into the mechanical side of the NC-80X. The NC-80X is a sensitive receiver that is certainly capable of functioning as a station receiver. However, the AC-DC power and some of the mechanical issues might limit its compatibility with other equipment. This 2006 restoration was more cosmetic than electronic. While more involved than a "detailing" job, it still can't be considered a "museum-quality" restoration. What is interesting is that I've restored this RAO-3 more than once. "Rios Radio Revisited" is a re-telling of how I found this receiver in 1969. A Brief Re-telling of "Rios Radio Revisited * "
When I was a 19 year old kid, I did a short stint at the local Post Office that involved substitute deliveries. I generally was at a different office and different route each day. On one of those "new to me" routes I came upon a house that had an old National receiver setting in the drive-way. A lot of weeds and grease around but the receiver looked pretty good. I lifted up the lid on it and saw the inside was full of small rocks and pebbles. Not too many tubes but lots of rocks. I knocked on the door, gave the resident his mail and pointed over at the receiver in the drive-way but I didn't get a chance to say anything before the guy blurted out, "Oh, you want that radio? Go ahead and take it. It's your's." I thanked him and loaded it into the back of the mail truck. I finished that route in record time so I could get off work and go down to see my old friend, Phil Rios. >>> >>> Phil had been in the Radio-TV repair business since 1946 and I had worked for him during the summers when I was in high school. I knew he would have the tubes that were missing and some suggestions on restoration. Of course, in 1969, restoring a WWII relic was more of "get it running" than anything else. With the rocks removed, I saw that about half of the tubes were still present and we needed the easy ones, the 6K7, 6J7, etc. After "tubing up" the RAO, we found a power cord that fit and a speaker (that was the wrong impedance - but who knew that then.) The RAO came to life and played pretty well with just a connection to the test TV antenna at the shop. Phil said, "Sounds pretty good. Run it for a week or so and then do an alignment and it should be a good set." It wasn't too long before the audio output transformer opened up. I had taken the receiver down to Rios' shop and had the bottom off. After poking around for a while with no progress, Phil must have felt sorry for my inexperience and started issuing orders. "Measure the 6K6 pin 3. Okay, now measure pin 4. Okay, you have an open audio output transformer." Phil knew all the connections in his head from years of experience. I went over to Schirmer's Electronics, the local parts house, and bought a small universal audio output transformer. Who knew that the RAO was supposed to have a 500 ohm audio output impedance? Well, I installed the new transformer inside the old housing and everything looked original but of course the output impedance was now 8 ohms. The RAO came back to life and was ready for use as my new ham receiver. How I made any contacts on 15M CW I'll never know, but I did. As far away as VE3BAW. Exciting stuff then. I later replaced the RAO with a Collins 75A-4 which was a vast difference in performance to a fairly new ham. I didn't get rid of the RAO though. I kept it in storage through several moves. In 2006, after more than thirty years of storage, I thought that the old RAO needed to be "revisited" again. Poor ol' Phil was long gone having been hit by a car while crossing the street in front of his shop. That was in 1989. I was a different person now, with 25 years of Industrial Electronics experience in engineering prototyping, test fixture design and field service repairing behind me. I also now had about 12 years (at that time) experience with owning and operating the Western Historic Radio Museum. The things I found that I had done to the RAO over thirty years ago were amazing - maybe even embarrassing! The goal now was to bring the RAO back to working condition and original appearance. This was going to require a total repaint and locating several correct type parts for the restoration. *"Rios Radio Revisited" was an article that I wrote for "Antique Radio Classified" that was published in that magazine around 1990. It combined a "found radio story" about the RAO-3 with a bio of Phil Rios. Plexiglass Dial Cover - Who knew this cover was supposed to be plexiglass? Not me, obviously, since I had installed a pane of glass. I guess that assumption was based on seeing an old NC-100ASD at the neighboring ham's shack when I was a kid (that was Dennis Antilla, WA6LHL, another mentor of mine mentioned in the NC-100ASD restoration section above.) I remember that receiver's dial cover was cracked, so it had to be glass (it's supposed to be glass in the ASD.) Like most RAOs, the plexiglass on this one was warped and discolored, so glass went in. Thirty years later, after realizing for some time that the glass was incorrect for an RAO, during this rebuild I replaced the glass with a correct plexiglass dial cover. Interesting Painting Problems - At first I thought I was going to be able to just spray over the original wrinkle finish with new wrinkle finish paint and the cabinet would look okay. Luckily, I tested the idea on the dial escutcheon first. Wells-Gardner used some sort of dark olive drab primer on the sheet metal that reacted with the new paint by "lifting" - almost like paint stripper was being used. So, with that idea eliminated, I had to strip each of the cabinet sheet metal pieces first. This was probably better anyway, since the paint job will be higher quality. The RAO-3 was cabinet pieces were prepped by light sanding with 400 grit Al-Ox paper and washing with lacquer thinner. You have to paint one side at a time because the wrinkle paint has to be hot to "wrinkle." I use heat lamps along with a heat gun to assure that the wrinkle is complete. Since the lamps are in a fixed position, only one side at a time can be painted and then put under the lamps. Apply at least three heavy coats of wrinkle paint with a time spacing of about 1 or 2 minutes between each coat. Then place that painted side under the lamps and standby with the heat gun. Wrinkling will take place in about 5 to 10 minutes. Use the heat gun on the corners and edges where the lights don't provide enough heat. Don't use too much heat from the heat gun or you'll "gloss" the wrinkle and it won't match. You don't need much heat, just a little to assure the you get full wrinkling on the entire panel-surface. If you're careful painting each side to not "over-shoot" the edge you'll find that each side will blend and when finished the cabinet looks like it was all painted at one time. Be sure to allow a little time for curing before assembly. Overnight is okay but a few days is better. Shown above is the main cabinet piece after wrinkle finish was applied. NOTE - this application is using Krylon Black Wrinkle Finish paint, not the VHT paint I now use. At the time I painted the RAO in 2006, only Krylon had wrinkle finish paint and when the Krylon was compared to true "black" paint, one will see that the Krylon is sort of a charcoal black, not deep, jet black. Minor Stuff - I had to make a cover for the small housing for the 1st RF Amplifier tube. This box is mounted to the rear panel of the cabinet and due to the necessity for complete shielding, the box does have a small cover. Additionally, the dial lamp harness was in terrible shape so I rebuilt it using correct period lamp sockets since the originals were missing their mounting brackets and the dial lamps were just shoved into the lamp holes. The four small control panels were straightened and then repainted. Mounting these panels, which were originally riveted, required making "fake rivets." These are 4-40 slotted head screws that have the heads turned down to look like rivets. The panels are then mounted with "fake rivets" and nuts. I usually remove any excess length of screw that extends past the nut to prevent any interference problems during reassembly. Observing the photo above in the RAO section of this article which shows the RAO-3 after detailing of the chassis, it can be noted that there are some minor problems remaining. Due to the cleaning most of the silk screened nomenclature is missing on the IF cans and from the chassis. Remember, this receiver was filled with rocks when I found it! Note that W-G used a different power transformer cover than National did. I'm not sure that this cover is correct since it was merely one that fit and the original cover was missing. The filter capacitors are not electrolytics. They are oil-filled paper dielectric capacitors which is why most of the RAO receivers will usually work somewhat with mostly original parts. Replacement of the paper-wax capacitors is recommended for best and safest performance, however. On the Air, Again - After many years of storage and then a second restoration, I finally did use my old RAO-3 "on the air." It was on the Saturday morning West Coast AM Net on 3870kc at 8AM. 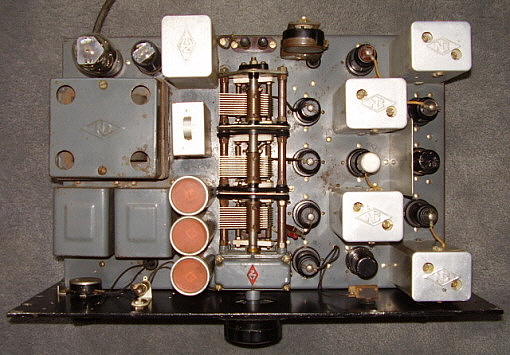 The transmitter was a Collins 32V-2. All I can say is that the RAO-3 performed quite well with its typical great sensitivity. Of note though, the RAO receivers do not have any significant bass reproduction in the stock configuration. The audio reproduction was pretty thin sounding - but, that's normal for the RAO. 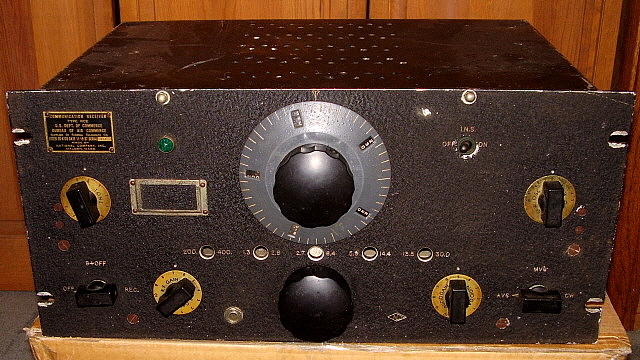 My initial use in 1970 was as a CW receiver, which really was it's most common mode of operation with the Navy. The Net operations went fine and the RAO-3 finished the entire Net without having to resort to using a back-up receiver. Although I wasn't configured for remote stand-by, that option is available on the RAO-3. I used the B+ OFF switch as the remote stand-by. Although I haven't used the RAO-3 with any military transmitters on the Vintage Military Radio Net, I have used my RAO-7 on several occasions and it also is a dependable receiver, providing plenty of sensitivity and stability, although not much bass response. The header photo in this section shows the finished RAO-3 mounted on an original RAO-3 shock-mount. Attention to detail is very important in any restoration. Correct mounting hardware and period finishes along with careful workmanship will result in an original appearance to any restoration. Without having a totally complete and original RAO-7 (SN:10/H720) as an easily accessible reference as to "what's correct?" I don't think I'd have been able to impart as much exacting detail into the mechanics of this restoration. Maybe this write-up might be "too much detail" on the mechanical aspects of the restoration but, if you're interested in minutia and appreciate the OCD-aspect of "attention to detail," then all of the work that was necessary in this restoration is covered in the sections that follow. Another RAO-7 made it into the shop in August 2018. Chassis serial number was J444. Two restoration attempts had been made by two different former owners over a period of a couple of decades. The former owners never seriously got into the electronics so the receiver chassis was all original. Having never been molested, the receiver actually functioned quite well. The serious problems that kept J444 from being an excellent example of the RAO family were all mechanical and cosmetic in nature. 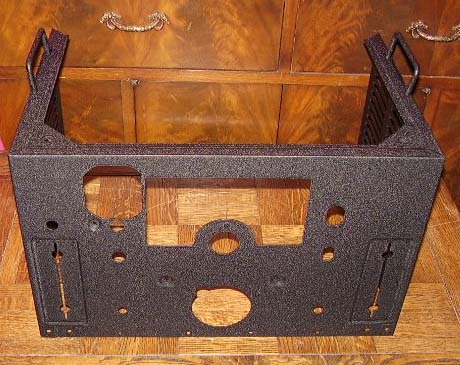 The last owner of the receiver had considered the original front panel "not restorable" so he made a completely new front panel out of 8 gauge steel and painted it black wrinkle finish. Since this was a "brand new replica" front panel, none of the hardware needed to be of the original size or type. For example, the dial nomenclature plates were mounted with screws and nuts instead of drive screws or rivets. It ended up that every piece that could be mounted to the replica front panel was mounted with a non-original size or type of hardware. Although at a distance the RAO-7 SN: J444 with its replica front panel looked pretty good, close-up the non-originality was fairly apparent. I was extremely lucky that this last owner had kept J444's original front panel and that it was included with the receiver. The original front panel had been modified somewhat and this was why the last owner considered it "not restorable" and made the replica front panel. However, I thought the original front panel only had minor damage and with a little All-Aluminum Body Filler and wrinkle finish "touch up" it could be brought back to a good appearance and returned to its original receiver. photo above: RAO-7 SN: J444 - after its mechanical and cosmetic return to original. 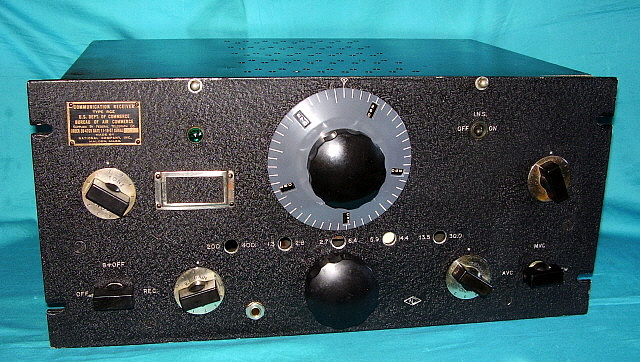 This receiver was destined to go to the South Pacific so it was given a MFP treatment. Besides the chassis, the front panel nomenclature plates and knobs were also MFP coated. This accounts for the yellowish color of the tags. Fixing Mod-Hole Damage and Other Hamster Mods - The original panel was actually in very good condition. Really, all that was required was to repair some minor modification damage. Luckily, none of the modifications were ever installed, only some of the preliminary "hacking" was done. There were two .375" drilled holes, two .250" holes and a "ring" of center-punched markings where an S-meter was going to be mounted. I used All-Aluminum Body Filler (ABF) to patch all of the holes. This was then sanded, primed and painted with black wrinkle finish (BWF.) I hand painted the ABF patches with BWF and then used a heat-gun to actuate the wrinkle. After this had set for a while, the entire panel was wiped down with thinned black nitrocellulose lacquer to even-out the color and bring out the luster. All of the patched holes except one were covered by data plates when the receiver was fully assembled. The escutcheon had a .030" plastic dial cover partially held in place with duct tape. The original dial covers were .090" thick plastic and didn't need duct tape to hold them in place. The logging scale pointer was bent incorrectly to allow for a non-original mounting of the thin plastic dial cover. This had the pointer mounted with a screw and nut through the plastic of the dial cover. The original mounting had the plastic dial cover "notched" to provide clearance for the pointer which was then bent to have the pointer against the backside of the dial cover plastic. The pointer should be mounted to the escutcheon using a flat-head rivet. A non-original hole was drilled into the escutcheon and into the lower part of the tuning shaft grounding fork to allow a screw and nut to mount the fork into a non-moving position for some reason. This was removed allowing the fork to be able to pivot on its mounting rivet. The drilled hole was filled with ABF and painted. Finding the Correct Hardware - There are literally dozens of major hardware dealers on eBay that specialize in supplying various types of fasteners. I'm surprised that nearly always, with enough searching, the exact size and type of screws or rivets can be found. The down side is that there will be a waiting period of a few days to a week for delivery. Planning the rework required in advance so you know what needs to be ordered ahead of time helps to reduce acquisition delays. Weird Screw Sizes and Odd Rivets - Original escutcheon mounting screws are 4-40 oval head phillips machine screws 5/16" long. These had to be purchased. These screw heads had to be painted flat black before installation. Original data plate mounting screws are 4-36 fillister head slotted machine screws 3/16"" long. I had six originals and needed two more. I made two fillister head 4-36 screws out of round head 4-36 screws. I turned the screw in a drill press and used a fine file to shape the round head into a fillister head. The nomenclature plates on the dial escutcheon had been incorrectly mounted with screws and nuts. I had to order the correct 3/32" diameter by 1/8" length semi-tubular rivets to mount these plates as they originally were mounted. These rivets were vintage and had the correct "raven finish" (black.) I used a .125" sheet metal punch as a rivet set tool and a solid copper plate for the backing tool. As mentioned, the logging scale pointer had been mounted with a screw and nut. The pointer itself needed to be reshaped correctly. It was then mounted as original with a flat-head rivet that was 3/32" diameter and 3/16" long. This was a solid aluminum rivet so a center punch was used as a setting tool and a copper plate used for the backing tool. The bezel surrounding the band select dial was mounted with incorrect 4-40 screws on the repro panel. The screw holes in the original panel are tapped for 3-48 screws. The original screws were 3-48 flat head slotted machine screws. I found the local Ace Hardware had 3-48 FH screws but in phillips. Since the main tuning dial escutcheon is original-correctly mounted with oval head phillips screws, I decided to go ahead and use the 3-48 FH phillips. The heads of these screws had to be painted black before installation. Captive Thumb Screw Assemblies - The thumb screws are 12-24 thread with a knurled and slotted head that is 9/16" diameter and with a shoulder and thread length of 15/16". These mount into a standoff that is 1/2" in diameter and about 7/16" tall. The standoff has a smaller diameter shoulder that is press-fit into the panel mounting hole and is then peened in place. All of the original captive thumb screw assemblies were missing. New captive thumb screw standoffs had to be made from 1/2" diameter brass stock. I had Chuck, KØDWC, machine nine standoffs each with a clearance hole for a 12-24 screw. The back of each standoff was drilled out to 5/16" diameter to a 3/8"depth. I press-fitted these standoffs into the panel and then the backs were peened with a rectangular punch (as original.) The standoffs were then painted with black wrinkle finish paint that was activated using a heat gun. The original size 12-24 thumb screws can't be found as new items. I really couldn't find anything except original RAO-7 thumb screws that were the correct dimensions and would function as "captive" screws. Since the panel-mounted replica captive thumb screw standoffs were built exactly like the originals, if original RAO thumb screws are found, they can be fit into the standoffs. This isn't as easy as it sounds. Each RAO thumb screw has a boss just behind where the 12-24 threads stop. This is to retain a small "C" clip. The thumb screw is inserted into the captive screw standoff from the front. From behind the standoff, the "C" clip is installed onto the thumb screw threads and then pushed over the boss. The boss keeps the clip from sliding off of the threads and the clip is large enough to keep the thumb screw from being pulled out the front on the standoff. The only solution is to have nine RAO thumb screw replicas made. Probably an expensive solution to the missing parts. For the time being, I can use the five RAO thumb screws that had been somewhat modified by a former owner and ruined for authentic restoration use. Although they will look original and function to hold the panel to the cabinet, they won't actually be "captive" thumb screws. MFP without the Odor - The receiver ID data plate, the "Notice" tag and the acceptance tag were not MFP'd. This was because these three tags must have come from a different RAO-7 receiver. Since the data plate serial number and the chassis serial numbers never match on these receivers (they are different formats and shouldn't match,) these data plates will be acceptable with a little MFP touch-up. I used a yellow-tinted nitrocellulose lacquer that has the appearance of MFP when applied as a spray. This is applied highly thinned so the correct color can be gradually attained by thin, successive coats. The data plate screws also have to be MFP'd since the data plates were sprayed after they were mounted. All of the nomenclature tags and the one nomenclature panels were in good condition with their original MFP. The second nomenclature panel needed a minor touch-up due to finger wear from operating the B+ switch. Thinned black lacquer applied with a brush and then sprayed a very light application of MFP (actually, my yellow-tinted lacquer.) In the original MFP application, the knobs were also sprayed with MFP. I cleaned the knobs with Glass Plus and a soft bristle brush. Whatever MFP was on the knobs was left on but I didn't spray any additional MFP. If you can't find yellow-tinted lacquer or can't find someone to mix you a batch, another MFP substitute is Amber Shellac. This is thinned with denatured alcohol and sprayed. You can also lighten the Amber Shellac by mixing in a little Clear Shellac to get the correct MFP color. The only slight disadvantage of using shellac is that it isn't very durable. However, for our "non-military, not it constant use" application it seems to work fine. Photo right shows the RAO-7 SN: J444 chassis and the appearance of a chassis that has had the MFP treatment. Note that the tuning condenser was not coated. Most of this MFP is original. What I've done is to coat the cover on the antenna input-1st RF amplifier box which was not coated since it was an original-part replacement cover. Also, the AC power input receptacle was a NOS replacement and had to be MFP coated. The Plastic Dial Cover - All of the originals dial covers were made out of an early type of plastic that warps, discolors and becomes opaque with age and exposure to light. Modern Lexan in a 14" x 11" sheet is available in .090" thickness from Home Depot. Lexan is very easy to cut and very resistant to cracking. I cut the semi-round cut-out using a hole saw first. Then the full dial cover is cut out using a jig-saw leaving the round hole now being a semi-circle. I added the small notch for the logging dial pointer using a Dremel tool and a round file. The original dial covers had a thin boarder of masking tape but this was probably because the old plastic had a tendency to crack. The masking tape can be added for authenticity but it isn't really necessary with Lexan. The dial cover sets on the two lower tabs and the notch provides relief for the logging dial pointer. That's all that holds the dial cover in place. When the dial escutcheon is mounted to the front panel, the plastic dial cover is then held in place securely. photo left: The new Lexan dial cover showing how the dial cover should just fit below the middle screw hole of the escutcheon and between the debossed panels of the control plates. Note the the bottom of the dial cover rests on the two tabs on each debossed panel. Although the original dial covers had a border of masking tape it isn't necessary with Lexan material. photo right: Close-up of the rounded cut-out for the tuning shaft and the notch that provides clearance for the logging dial pointer. Note the the pointer is bent to allow it to clear the dial cover yet lay flat against the back of the plastic. In both photos the protective plastic sheeting hasn't been removed from the Lexan. AC Power Input - The RAO-7 originally uses a twist-lock, three pin male, welled receptacle for the AC input. The power cable originally was two conductor with a shield. At the time, many Navy AC sources had "floating" AC lines, that is, the neutral wasn't grounded. Since the circuit uses a power transformer, it doesn't matter that nowadays neutral is grounded. Also, most RAO-7 receivers don't have their original shielded power cables anymore. It's okay to use a three conductor cable and use the ground pin of the twist-lock as the chassis ground, it's tied to chassis anyway. 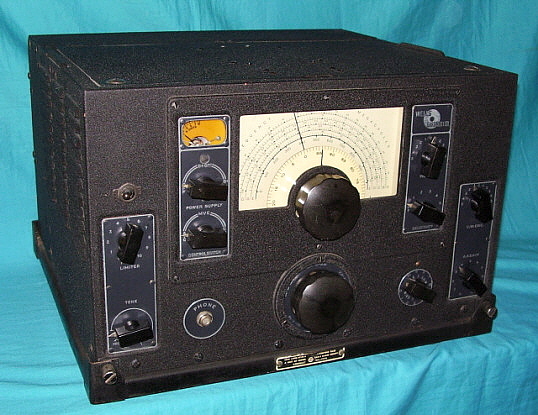 This RAO-7 had been modified to use a modern test-equipment type of rectangular receptacle and a molded AC test equipment power cable. Luckily, I had the correct, original type of welled, AC twist-lock receptacle which was installed so an original type RAO-7 power cable can be used with the receiver. I applied MFP-color lacquer so the new socket would match the other components nearby. Retaining Screw - The front panel has a 6-32 hex head screw mounted with an off-center hole washer and a spacer washer to the backside behind the dial escutcheon on the AC/B+ switch side. This screw end is normally deformed so it can only be loosened, not removed. The purpose of the screw and washer is to provide a firm clamp for the sheet metal bracket the holds the AC/B+ switch and the AVC-MVC-CW switch. The original screw was broken off of the panel. I drilled out the remaining piece and chased the threads of the hole. I found a hex head 6-32 and made a off-center washer. This was threaded into the panel from the backside. During reassembly of the receiver, this screw was tightened against the AC/B+ switch bracket. I had to make sure the screw wasn't too long since the dial escutcheon has to mount over it. I then loosened the screw and deformed the end of screw so it couldn't be totally removed. I then retightened. photo above: left side handle and replica captive screw standoffs Other Hardware and Miscellaneous Stuff - The grab handles were badly nicked up with a lot of missing paint. I sanded these to even out the surface and then painted them with black nitro-lacquer. On top of the crystal filter assembly two solder "globs" were indications of some sort of past hamster work. I removed the solder and then "touched up" the area with MFP to match the rest of the crystal filter box. Additionally, the RF input box cover wasn't MFP'd. Apparently it was replaced sometime in the past. It would have been coated when the receiver chassis was sprayed, so I went ahead and sprayed the cover with MFP. Anti-Backlash Adjustment - When tuning the RAO-7 it was obvious that there was significant backlash in the gear box. Since the receiver had the front panel dismounted and the tuning dial assembly had also been removed, the anti-backlash would be an easy adjustment. With the gear box cover removed and with unobstructed access to the front of the gear box, the front bearing hub mounting screws have to be removed. Then the hub can be slightly pulled forward. This disengages the drive gear from the idler gears and allows adjustment of the spring-loaded gear on the left side. By holding the right side gear, the left gear is rotated clockwise about a quarter of a turn and held in place. Then the hub and front tuning shaft are slid back into the gear box. The tuning shaft gear keeps the anti-backlash gear in place and the spring-loading eliminates any backlash in tuning. Also, you have to watch the idler gear below the tuning shaft gear. This idler gear has an embossed projection that interacts with another projection on the tuning shaft gear. The difference in the ratio of the two gears results in these two projections acting as "stops" once every ten turns. The easiest way to set the stops is to insert the tuning shaft into the gears with the tuning condenser fully meshed. Have the idler gear stop on the left side of the tuning gear stop. Insert the tuning shaft while holding the drive gears with the proper backlash. Test the gear set by tuning the gear box from the low end to the high end of the range. At the high end, the stops should again hit. When set correctly, the tuning stops will be slightly below the beginning of the dial scales on the low end and rotate to quite a bit beyond the dial scale at the high end. Be sure to check the tuning condenser drive gear set screws. They should be tight to prevent any movement in the tuning condenser shaft other than that imparted by the gear drive. When everything is set correctly, the tuning shouldn't bind and no backlash should be felt when the tuning and the stops should happen as described. Normally, this adjustment was done at National and unless the gear box has been tampered with it shouldn't ever need readjustment (guess this one had been tampered with.) I also cleaned and lubed the gear box before reassembly. Tuning Shaft Reassembly - The tuning shaft should have a special spacer on the tuning shaft that fits slightly over the tapered split-bearing on the gear box hub on one side and presents a conical surface on the opposite side. This conical surface mates with the concave side bearing surface on the backside of the hub of the logging dial. When the logging dial is positioned as far back as it will go on the tuning shaft and the tuning shaft itself pulled all the way forward and then the logging dial set screw tightened, there will be the correct spacing for the main tuning pointer behind the logging dial and clearance for the backside of the tuning dial cover in front of the logging dial. When the dial bezel is mounted, there should be sufficient clearance between the logging dial pointer and the logging dial. Before mounting the dial bezel, install a thin brass washer on the tuning shaft and position it back against the hub of the logging dial. When the dial bezel is mounted to the panel then the tuning shaft fork will bear against the brass washer in front of the hub of the logging dial and ground the tuning shaft and bezel. Install thin fiber washer and then the cone compressible spring washer and finally the tuning knob. When all together, the RAO tuning should feel somewhat firm and have a slight resistance to the action of tuning. Although the earlier NC-100A gear boxes with their weighted tuning knob allowed for "spinning the knob" type tuning, the RAO-7 has a somewhat different gear box with another idler gear inside along with a non-weighted knob. Apparently the USN wanted the RAO-7 tuning to not be "velvet light weight" but rather the receiver tuning action should be firm and deliberate. IF Alignment- The most difficult part of the alignment procedure is that the RAO-7 has to be on its side to access the catacomb for front end tracking adjustments. There's also one crystal filter adjustment that is accessed under the chassis. The IF is 455kc but actually the exact crystal frequency should be used for best crystal filter performance. The signal generator is coupled to the Mixer grid thru a .1uf capacitor. The output of the receiver is used for monitoring the gain by using an Audio Output Meter. This will require the RF generator to supply a modulated signal. AVC should be turned off. Only the minimum amount of signal level should be used in any receiver alignment. Crystal Filter Problem - When I attempted to find the crystal "peak" frequency for the filter I couldn't hear the usual abrupt signal increase that happens as the generator frequency is swept across 455kc. I suspected that the crystal was inactive for some reason. The left side panel has to be removed from the crystal filter assembly to access the components that are all located inside the metal box. The screws are all self-tapping hex head sheet metal screws. There is one stud mounting the panel to the chassis so that nut has to be removed from underneath the chassis. When I had access to the inside of the crystal filter I checked all of the connections to see if any were broken or were disconnected but everything looked good. I unsoldered the crystal which is the type that is entirely contained within a bakelite housing with terminals on the sides. I tested the crystal by "ringing" it. That is, connecting a RF signal generator, the crystal and an oscilloscope in series with the return being the 'scope ground to signal generator ground. At the crystal's active frequency, there should be a pronounced sharp increase in the signal shown on the 'scope. There was no "peak" at all. This indicated that the crystal was inactive for some reason. >>> >>> Since I had a "junk set" NC-200 that still had the crystal filter assembly and since the NC-200 filter uses exactly the same crystal filter as the RAO, I had a parts source for a replacement crystal. The crystal was removed from the NC-200 and tested. It showed a very pronounced activity at 455kc, indicating it was a good crystal. Installation into the RAO was followed by a quick test to make sure the crystal filter did function. Then the side panel was reinstalled. Since the filter had been apart and now had a different crystal installed, a new IF alignment had to be performed. Many hams don't use crystal filters but I find them to be one of the most important features on vintage receivers. Even on AM, a functional crystal filter will always be a valuable tool in combating QRM. RF Alignment - Tracking was very close on bands E, D, C and A. However, Range B was aligned to the image frequency and this required quite a bit of readjusting to get everything back to the correct tuned frequency. Alignment to an image is most likely to happen on Range A but the high end of Range B is over 14mc and with a sufficiently strong signal input from the RF generator it would be possible to hear the image and mistake it of the correct alignment frequency. When aligned to an image, the tuning range will not track properly (error at 10mc was about 500kc) and the gain across the range will not be equal. It's important, especially on Range A, to keep the signal generator level as low as possible. Also, check the location of the image,...it should be 910kc below the actual signal frequency input. To test the image location will require a fairly high signal input level to actually hear the image. If the image is at 910kc below, then that particular LO is adjusted correctly. It's also possible to adjust the Mixer to an image. As before, keep the signal generator level as low as possible to avoid mistaking the image for the correct frequency. A proper load should be used for the RF sections. Use a .1uf capacitor for Range E and a 100 ohm resistor for the other ranges. 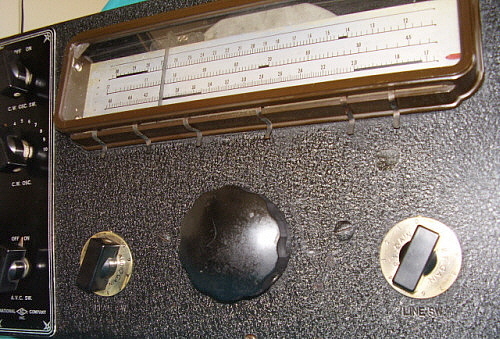 Performance and Panoramic Adaptors - When the RF tracking alignment was completed, the accuracy of the tuning dial was impressive for a WWII vintage receiver. Of course, the resolution is limited but for WWV checks and other known transmitted signal frequencies, the accuracy was excellent. As mentioned above, the tuning action is somewhat firm. If the anti-backlash is adjusted correctly, then this doesn't prevent tuning in CW or SSB signals easily. The BFO can be slightly adjusted to aid tuning in a SSB signal. The BFO adjustment rapidly changes the frequency so any "fine tuning" in CW or SSB will require a "light touch." Sensitivity was good, especially in the CW mode. The AVC is very strong and cuts back the sensitivity quite a bit in the AVC mode which is how most AM listening is done. Selectivity is about 8kc bandwidth without the crystal filter and can be narrowed as needed with the filter. Audio is pretty good considering the restrictions that the USN wanted in the receiver. With a large, matched speaker, AM and SW BC stations sound very good. Since the RAO-7 was specifically for use with a panoramic adaptor, most of the RAO-7s were operated in MVC or BFO. If the receiver were in AVC then the center peak signal on the panoramic adaptor would be attenuated due to the AVC action cutting back the sensitivity of the receiver. If the RAO-7 was used for communications, then that most likely would have been in the CW mode. 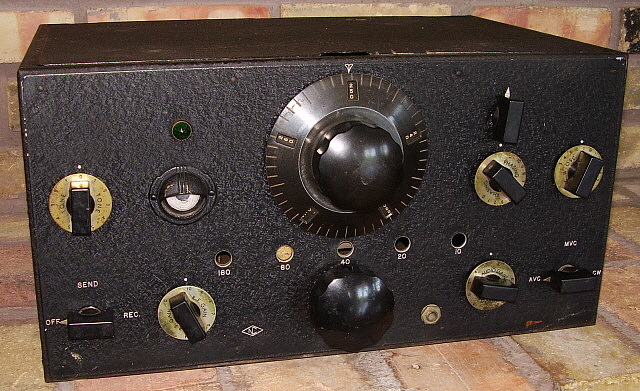 In its WWII use, most RAO-7 receivers probably were very seldom used with the AVC turned on. However, today most RAO-7 receivers will probably be used in the AM mode with AVC on. Expect the sensitivity to be somewhat restricted by the "strong" AVC-action. Typically, for AM, RF gain will be at 9+ and the AF gain will be set to about 5 for loudspeaker listening. Phones are connected directly to the output transformer so the AF gain would have to be reduced significantly for headset listening. You can also connect the 600Z ohm loudspeaker to the Phones jack if you don't want to use the rear chassis terminals. The RAO-7 doesn't have remote standby capabilities due to its intended use during WWII. It's easy to just use the front panel B+ ON-OFF switch for the standby function. Receiver antenna input isolation must be considered and this can be accomplished with either an external DowKey relay or by using the Sending relay internal to most commonly used vintage military transmitters. Wrap-up - I'm not really sure if many of the RAO-7 receivers were ever used for communications. But, there are several photos on the Internet showing banks of RAO receivers being used for surveillance. With its direct output connection (with internal 50K ohm isolation) for a panoramic adaptor and the conspicuous absence of the S-meter, surveillance seems to have been the primary role for the RAO-7. Still, it's a great receiver for the vintage military radio station. I have my two as a "pair" and "paired with" an AC operated ART-13 transmitter. Certainly not protocol during WWII but I did see in a 1947 Radio & TV magazine where a ham station in Hawaii was so equipped. Nice receivers that, although they weigh a lot, also provide a lot of performance not to mention their incredible bench presence. 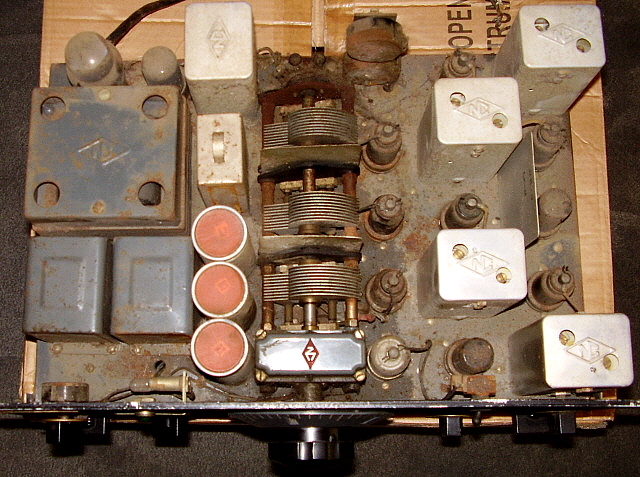 Conclusion - With over sixty different versions of National's Moving Coil receiver design having been produced over a period of thirteen years, including increased production for WWII, one has to conclude that the NC-100 Series were rugged performers that were very popular with all of the different types of end-users. From hams to the military and to the users at many airports around the country. 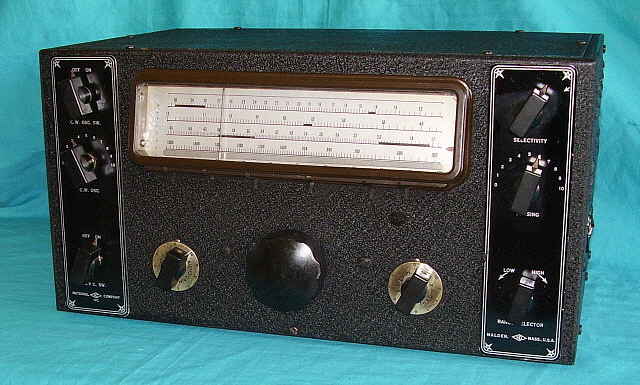 From the late-thirties up to the early fifties, the Moving Coil receivers provided successful communications to a diverse group of radio users and listeners. Although the NC-100 "catacomb" may have started out as a mechanical compromise for plug-in coils, its reliability soon proved that the movable coil catacomb was not only virtually indestructible but also gave the user top performance. With a few "tweaks" from National, the NC-100X went on to become the NC-101X, a popular ham bands-only receiver. 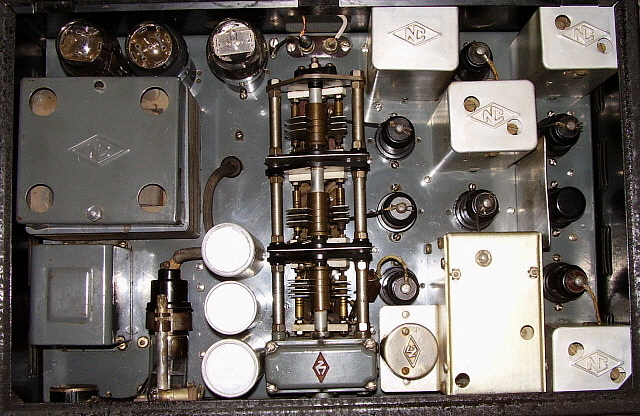 With other "tweaks," the NC-100 went on to become a popular, well-used Airways Receiver with versions produced for over a decade, even being rebuilt and used after WWII. 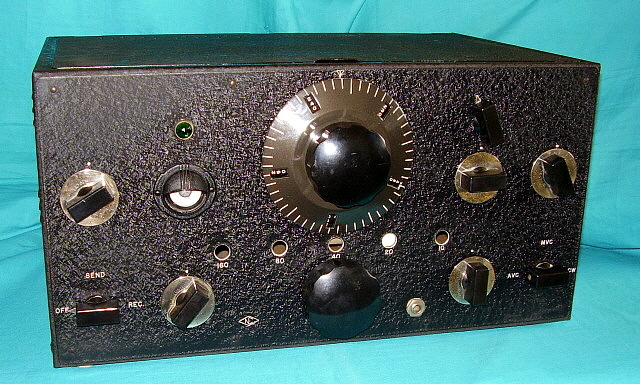 With further additions, the NC-100XA became the famous WWII USN RAO receiver. Today, any of the Moving Coil receivers can be rebuilt, aligned and then used for solid reception on the ham bands all while providing great audio. Truly, the Moving Coil receivers were National's "second-greatest" creation and certainly must be considered another "masterpiece." photo above: NC-101X sn: 40-X with its matching loudspeaker - ready to use "on the air!" 1. Original Manuals for NC-100, NC-100ASD, NC-200, NC-2-40D, RAO-7/9, RCF, RCQ, RCR - Original manuals or copies of original manuals will provide circuit descriptions and operational procedures that reflect the manufacturers' design intent. 2. QST Magazine 1936 to 1948 - Original advertisements are good for providing a time line in the evolution of the design and which of the features the manufacturer believed were important at the time. 3. Communications Receivers, 4th Ed. - Raymond Moore - The best reference book for production details on early receivers. 4. The Coil Catacomb Radios and Variations on a Theme by: Lawrence R. Ware - AWA Old Timers Bulletin - 1998 - This article covers all of the receivers that used the moving coil system with lots of photos of seldom encountered versions. 4. BAMA, Boatanchor Manual Archive - aka BAMA Mirror site (or BAMA edebris) is a great online source for many old manuals. Great for reference on rigs you don't own but maybe want to. 5. Thanks to all of the National Co., Inc. radio enthusiasts - who have provided photos, serial numbers, circuit and performance data and other information via the National Radio Reflector and via e-mails.